Is Philip Morris International Stock Getting Overvalued? Was the tobacco giant’s 25% year-to-date rally justified? Philip Morris International (NYSE:PM) is generally considered a slow growth income stock. Yet shares of the tobacco giant have rallied 25% since the beginning of the year to a historic high and crushed the S&P 500's 6% gain. That big rally likely caused many investors to wonder if PMI is becoming overvalued relative to the market and its industry peers. Let's take a closer look at PMI's fundamentals, growth estimates, and potential catalysts to decide. Philip Morris and Altria's iconic Marlboro brand. Image source: Pixabay. Is Philip Morris fundamentally overvalued? A simple way to see if an income stock is overvalued is to check its P/E ratio and dividend yield. PMI currently trades at 25 times earnings, which is higher than the industry average of 21 for cigarette makers. Altria (NYSE:MO), which spun off its international business as PMI in 2008, trades at just 10 times earnings -- but that multiple was notably distorted by a big windfall from the sale of its stake in SABMiller to AB InBev last year. 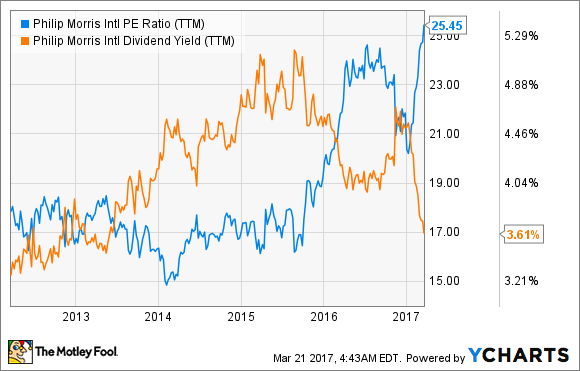 PMI pays a trailing dividend yield of 3.6%, which is higher than the S&P 500's average yield of 2% and Altria's 3.2% yield. But if we look at P/E ratio and dividend yield over the past five years, we'll notice that the former is at a historic high and the latter is at a multi-year low. This means that investors who buy PMI today are paying a premium for the stock while getting a much lower dividend yield than investors in previous years. How fast is Philip Morris growing? Stocks generally trade at a premium if they're posting higher-than-expected growth. PMI's growth initially looks tepid, but it's rebounding from big declines in previous years. Its revenue rose 1.4% in 2016, compared to a 10% decline in 2015. Analysts expect its revenue to rise 6% this year and 7% in 2018 -- if the U.S. dollar weakens. The strong dollar has been a major headwind for PMI over the past few years, since PMI generates all of its revenue overseas but reports earnings in U.S. dollars. PMI's adjusted earnings grew 1.4% in 2016, compared to a 12% decline in 2015. Analysts expect its earnings to rise another 8% this year and 11% next year. Like most tobacco companies, PMI offsets slower cigarette shipments with higher prices, job cuts, and investments in adjacent markets like e-cigarettes and other alternative tobacco products. But unlike Altria, which relies heavily on buybacks to boost its earnings, PMI has stopped buying back stock in recent quarters due to the impact of the strong dollar. If that headwind fades, PMI will likely start buying back shares again. What are the potential catalysts? PMI's top and bottom line recovery is encouraging, but the stock is also likely being lifted by low interest rates, making blue chip dividend stocks look better than bonds. However, that trend could reverse as the Fed gradually raises rates. Higher interest rates could also cause the U.S. dollar to strengthen -- which would be bad news for PMI. The other potential catalyst for PMI is inorganic growth. Several analysts have speculated that PMI could buy Altria to recombine the two halves of the Philip Morris empire. Wells Fargo analyst Bonnie Herzog suggests that megamerger would counter the tougher competition brought on by British American Tobacco's recent decision to buy Reynolds American. Herzog also believes that purchase would mutually boost both companies' positions in non-cigarette products (with Altria's MarkTen e-cigs and PMI's iQOS "heated" tobacco sticks) while offsetting PMI's currency headwinds. But even if PMI decided to buy Altria, it could lift the latter's stock more than the former. Should you buy Philip Morris today? I've bought and sold PMI in the past at lower prices, but I don't think investors should chase the stock's recent rally. Its multiple is too high, its yield is too low, and there are too many uncertainties regarding currency fluctuations, competition, and potential megamergers on the horizon. Investors who are looking for better income plays should consider cheaper stocks in other industries instead.